The species is widespread in the southern half of Britain, with very scattered records further north. It is widespread in north-western and central Europe. P. prativaga occurs on open ground and herbage in various open habitats including grasslands, waste ground, fields, heathland, woodland clearings, dunes, old quarries and roadside verges as well as in wet places such as dyke edges, fens, marshes and bogs. At Braunton Burrows in Devon, the species has been recorded across the dune system from the seaward mobile dunes, through the dune slacks to the landward heathy area with bracken (Merrett 1967b). The genitalia are quite distinct from Pardosa pullata, yet inter-specific copulations have been observed and fertile eggs sometimes result. This has only been seen with specimens in captivity, but it has been suggested that if this also happened in nature it could explain the fact that specimens are sometimes captured with the sexual organs of one but with the colouration approaching that of the other (Locket & Millidge 1951). The spider is adult mainly in early to mid-summer. 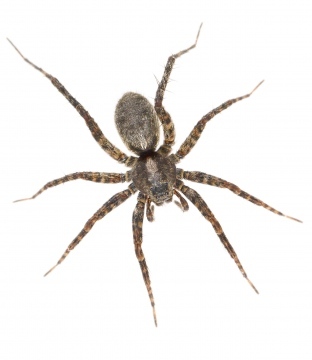 The spider may be abundant locally, but is scarce in northern Britain.